Going to the gym isn’t for everyone. The costs can be high, you may find it hard to get to a convenient location or you may feel self-conscious if you’re new to exercise. Regular moderate exercise is vital for reducing cardiovascular health risks, managing your weight and fat content and preventing back and joint problems. The increase in muscle to fat ratio also helps your body burn more calories and boosts your metabolism. It is generally much harder to manage your weight long-term without exercise. There are exercises that can be done at home to achieve all fitness goals including cardiovascular fitness, fat burning, strength, endurance, core strength and stability. They don’t require any equipment because your bodyweight is more than enough resistance to achieve most fitness objectives. Because they are “compound exercises” (using many muscle groups simultaneously), you burn more calories per minute and a full-body workout takes far less time. They also better replicate the kinds of movements you do in everyday life, reducing the risk of injury. - Always begin exercise by warming up. Warming up means getting the muscles you are about to use ready for activity. Your warm up should work the muscles you're about to use, there's no point jogging as a warm up if you’re embarking on upper body exercise, for example. - Perform exercises carefully and with control. Do not rush as this can cause injury and strain. As a general rule, you should allow two seconds from your starting position to end position and another two seconds to return to your starting postition. If you have any medical conditions or injuries, please consult a doctor before embarking on any new exercise programme. Ensure you're performing the exercises below correctly by practising them in front of a mirror and compare your position with the images. Maintain a strong core to protect your back by tensing the muscles in your stomach as hard as you can then releasing by half and then half again. Roll your shoulders up, back and down, with your feet hip width apart and your knees soft. An oldie but a goodie, especially when the form is correct. Squats work all major muscle groups in your legs and your lower back. Adding in a half-arm raise helps improve stability and further works other muscle groups. Aim to complete 2 – 3 sets of 10 repetitions and build up to 15 – 20 repetitions over time. This is harder than squatting as the legs are working constantly and it is a very effective exercise for all the muscles in the leg. Go for as long as you feel you can (as a guide, aim for 10 – 30 seconds to begin with) and aim to increase the length of time of the hold as your fitness improves. Begin with one leg forward and one back and perform the lunge, focusing on achieving the angles in the photo and keeping your back straight. This works all major leg muscles as well as the shoulders when holding your arms out to the side. Aim for 2 – 3 sets of 10 repetitions with the right leg forward and then the left. This exercise works your upper, middle and lower back, gluteal muscles, hamstrings and triceps. Lie on your front with arms by your side, palms facing the floor. Raise your chest up as high as you can, and raise your arms and legs, with thumbs towards the ceiling. Hold this for 3 – 5 seconds and return to your start position. Aim for 2 sets with 5 – 10 repetitions. Lie on your front as before. Bring your chest up off the floor and try to reach towards and touch your right ankle with your right hand. Return to centre and do the same on the left. This works the same muscles as the skydiver with the additional benefit of working the latissimus dorsi muscles (“lats”). Aim for 2 sets of 10 repetitions. 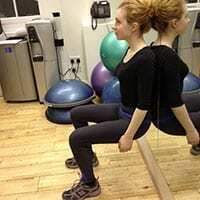 This works your middle and lower back and gluteal muscles, hamstrings and calves. Lying on your back with knees bent, push your hips high towards the ceiling. Hold for 5 – 10 seconds and return. Aim for 2 sets of 5 – 10 repetitions. If you’re feeling brave and want a bigger challenge, try the exercise with one leg vertically raised and repeat with the other leg. The original and the best. This is the single most effective exercise for firming, strengthening and toning the chest and has the added benefit of working your shoulders and triceps. Don’t be afraid of push-ups. You can begin these on your hands and knees and move towards lifting your knees off the ground once your core strength has developed. Jumping into the advanced position when you’re not ready can cause back injury so take it easy. Aim for 2 – 3 sets of 10 repetitions. You can aim for more, up to a maximum of 15 repetitions, as your fitness improves. Core strength is vital to overall fitness and stability and helps to prevent back injuries. Improving your core strength will help you reap benefits in every physical activity you do in everyday life and during exercise. Start by lying on your back, knees bent and feet on the floor. Tense and squeeze your abdominal muscles to raise yourself off the floor. As soon as your shoulder blades have left the ground (approximately 30 degree angle), your abdominal muscles are working to their full potential. Any more, and you’re straining your back. Hold that position and slowly move your arms in an arc to over your head and back. The further your arms go back, the more resistance your abdominals have to hold up. Aim for 2 – 3 sets of 10 repetitions.